A redevelopment of Royal Edinburgh Hospital campus is the main beneficiary from a £409M investment package announced by Deputy First Minister Nicola Sturgeon. £120M has been awarded to enable the hospital to complete its redevelopment. The rest of the funding will go towards new hospitals and health centres around Scotland, with investment to be secured through a £1Bn extension to the Non Profit Distributing (NPD) programme. The NPD programme, which caps private sector returns, now extends through to 2019-20. This model has been developed by the Scottish Futures Trust which was set up by Government to support infrastructure investment in Scotland. Main contractor Morrison Construction is currently carrying out the first phase of works on site at Royal Edinburgh Hospital. 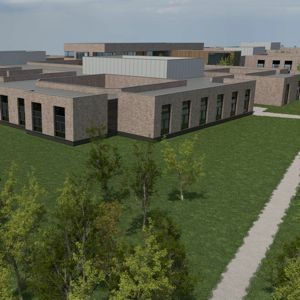 This includes a new £48M facility providing services for the adult acute mental health inpatient service, an older people’s mental health assessment unit, intensive psychiatric care service and a new Robert Fergusson national brain injury unit. Phase one of the project is expected to complete in 2016. Other funding allocations from the £409M package include £90M for the development of Aberdeen Women’s Hospital, £20M for the new Aberdeen Cancer Centre and £65M for East Lothian Community Hospital. £20M will help fund community health projects in the Highlands including Skye, Lochalsh, south west Ross-shire and in Badenoch and Strathspey, while £19M will go towards primary care in NHS Greater Glasgow and Clyde and another £19M towards primary care projects in Grampian. Community health projects will be delivered as Design, Build, Finance and Maintain projects. Details of other benefitting projects will be announced “in due course”. Ms Sturgeon said: “These health projects will provide state of the art facilities to care for thousands of patients across Scotland.